Transformational Sailing is here to serve veterans and others facing stress related challenges resulting from wartime experiences by providing a way for them to regain their sense of identity, their sense of value and their emotional equilibrium. 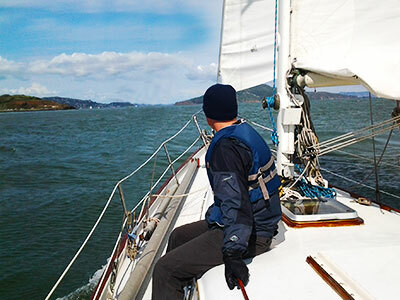 We take them sailing on San Francisco Bay where they experience camaraderie, joy, and renewal, in the natural healing environment of the wind, sea, and sky. 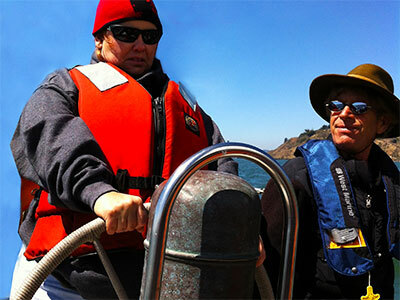 In the course of these trips, completely away from their day-to-day environment, they develop teamwork, as they learn sailing principles and relearn to communicate as they participate as a team in the operation of the boat. They relax and open up to new friendships and support in nonjudgmental and non-threatening surroundings in which they learn to succeed again. Having been disconnected from friends, family, civilian work and career and having lost a sense of their place in society, and in some cases their identity, this experience helps them to reconnect with those essential aspects of life and begin the rebuilding and normalizing process they so desperately need. Our Vision focuses around the goal of Assisting veterans and others with trauma who are disconnected from friends, family and normal living to reconnect with those essential elements of life. We also want provide stress-management coaching and help them to recover and re-discover life skills of self-confidence, communication, working with others, and leading them to re-integrate into society. Establish a regular schedule of sailing activity in a context of physical activity, open communication and reliance upon others. Present introductory sailing instruction in order for the participants to develop a set of skills that permits them to achieve success as they undertake tasks as part of a team. Provide a climate that encourages safe discussion, mutual support and regeneration. Through collaborative relationships with therapists, agencies and organizations, establish a referral process to identify and invite prospects who may benefit from the program.